Warren Jessop of Maui Catchment Service has designed and installed a HOG water catchment system for air conditioning condensation – a use that demonstrates the multi-functional adaptability of the tanks. “If you have plants around the building, why not water them with the AC condensate?” asks Jessop, who was looking to move water from a potential problem spot to “where it could do some good” hydrating thirsty plants with his pressurized (non-gravitational) HOG install. Jessop’s client, Volcano Maui Group, LLC owns a three-level commercial office building in Lahaina, Maui. A basement-level private parking lot is available for tenants. The condensation generated by building’s AC systems (12 in total) is collected and discharged via one main pipe into in a rain drainage sump located below the basement parking lot, where the presence of the water presents various maintenance issues. The solution? 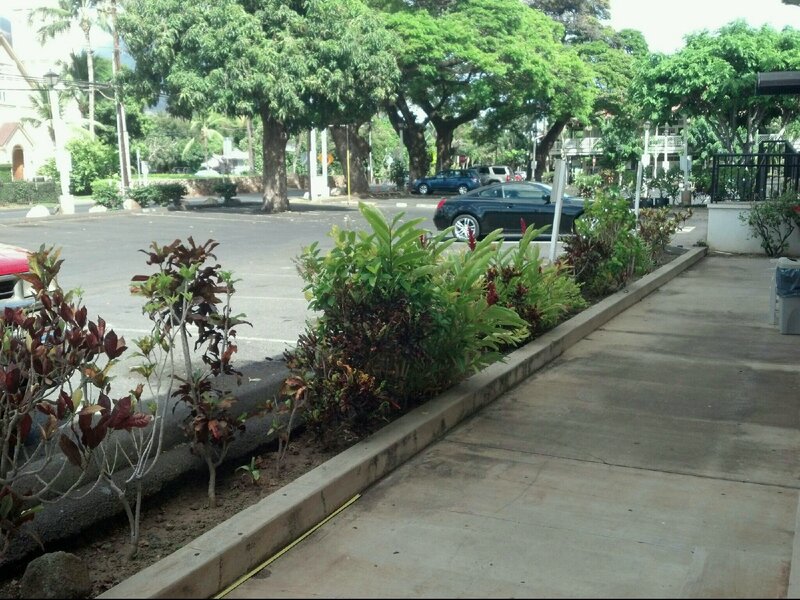 Plumb the AC collection pipe to a four-HOG system, and use a pump to redistribute the water via pipes and drip irrigation to the yellow hibiscus, red ginger, multi-colored crotons, night-blooming jasmine and other plants growing outside in the gardens of the exterior parking lots. The catchment system is installed around a central elevator shaft, the location of which made the narrow HOG tanks the best choice for the job. This HOG installation collects water for distribution without restricting driver access or maneuverability in the underground parking lot. “Rainwater HOG [tanks] make it easier to catch the water without taking up a lot of space,” says Warren Jessop, who sees the HOG air conditioning catchment system as a replicable model for other commercial buildings. The ‘primary port’ tank (shown above) serves as the collection point from which the air conditioning water is dispersed across the four-unit system, as well as the distribution point from which the water is pumped out. “The tanks are drip free,” reports Jessop, who installed a 5′ tall 3/4″ PVC pipe inside the ‘primary port’ tank which sends out the water with the help of a pump. It is accessed via a piggy-back float switch in the tank that sends irrigation water out automatically once the reservoir reaches a certain level. Pipes along the ceiling lead the water to a drip-irrigation system for the outdoor vegetation. 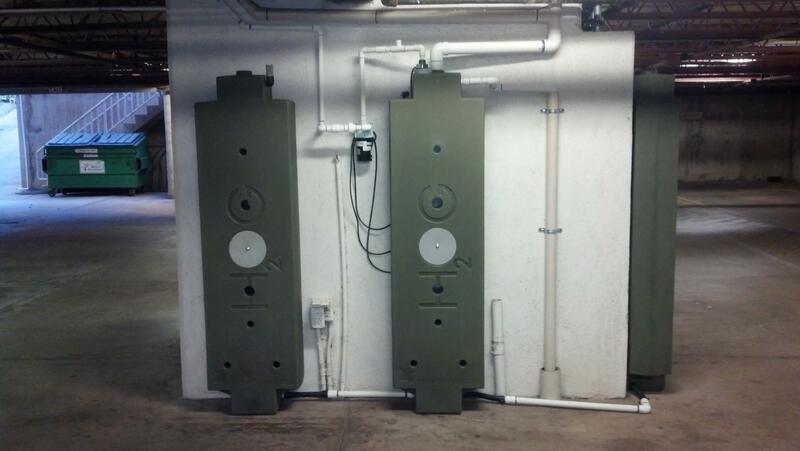 Transforming unwanted air-conditioning waste into water-savings is just one out-of-the-box (or maybe we should say, around-the-box) way that HOGs, with the guidance of an educated systems-installer, can save the day. Maui Catchment sourced the four HOG tanks from Green Builders Depot. 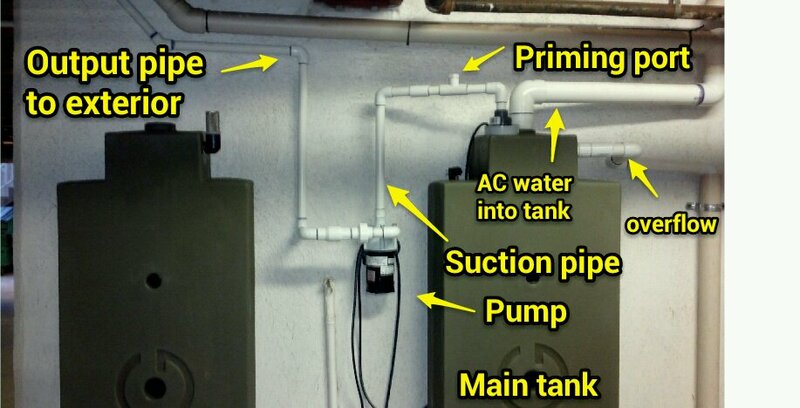 This entry was posted in January 2014 and tagged AC catchment system, AC water catchment, air conditioner catchment, catchment system, Green Builders Depot, Hawaii, HOG, HOG case study, Maui, Maui Catchment Service, rainwater HOG by Mattie Blue. Bookmark the permalink.